DRIVER OF THE YEAR – Pro Stock sensation Wayne Gapp, second from right, was honored as IHRA’s Driver Of The Year when the International Hot Rod Association held its annual Awards’ Banquet at the Country Club of Bristol Saturday night. 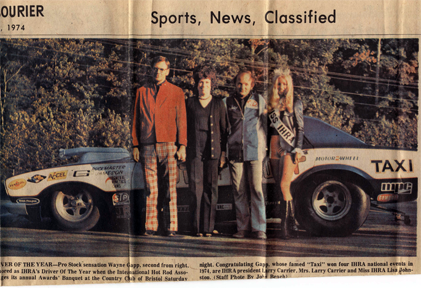 Congratulation Gapp, whose famed ‘Taxi’ won four IHRA national events in 1974, are IHRA president Larry Carrier, Mrs. Larry Carrier and Miss IHRA Lisa Johnson. (Staff Photo by John Beach).